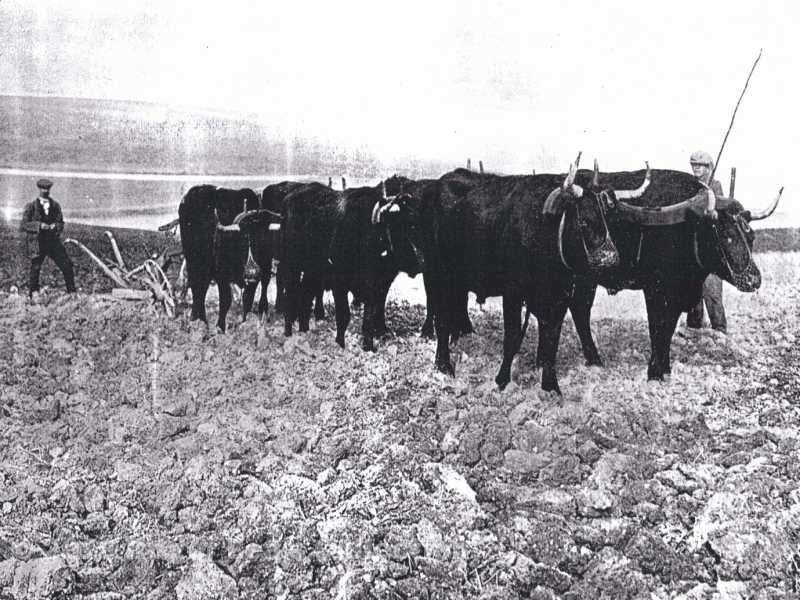 In listing his land, Greasebrook described “a way or convenient passage to turn a team to go into that ground over the end of the arable land” showing that he was still using a team of oxen to draw his plough. The list of his goods includes four oxen and two ploughs. Similar records survive for his neighbour, the yeoman farmer Richard Somerland, who died in 1686. He had more land than Greasebrook - there were 25 days work of wheat and 27 days work of peas barley and oats growing in the fields when his goods were listed on May 3rd - and the value of his goods was £350 compared with Greasebrook’s £140. His land was also mostly in the three open fields, and he also had two ploughs, but the only draught animals were his horses, two geldings, three mares and a colt. Oxen were very strong, but slow and cumbersome; whereas a horse-drawn plough was more manoeuverable and suited to smaller, square fields. Oxen were specially bred cattle, so at the end of their working life they would yield leather and beef; although a ploughman may have felt so hungry he could eat a horse, horseflesh was never an English food. By the seventeenth century, horses were being specially bred for farm work, and hardly any ox-teams were left in Sutton. By 1900 the Shire Horse was the farmer’s preferred breed - until 1950 there was a stud farm dealing in shire horses at Wylde Green.